Note: This is the required reading for Facebook 221, part of the Facebook major track for Social Media University, Global (SMUG). More information about SMUG and the homework assignments for this course are at the bottom of this post. I have written previously about Facebook Pages being like a free multi-media Yellow Pages listing. I got my dead-tree phone directory analogy wrong. In reality, with some relatively recent changes in how Facebook manages its URLs for Pages and people, and the fact that profiles and pages can now be found by Google searchers who aren’t Facebook members, a Facebook page can be a great White Pages listing. Before Facebook launched its Pages program for organizations, I had recommended that organizations and businesses and other organizations should develop Facebook Groups. One of the key reasons was because anyone can form a group with any name, and if they mention your business name in their group description, people will find that group when they search for your business in Facebook. By creating a group and getting lots of members, your “official” group would come up highest in the Facebook search results. But now, with Pages having been established as the way for organizations to have “official” Facebook presence, they are great tools for searching both inside Facebook and in the wider Web via Google. They’re much better than groups. Facebook groups cannot be found through Google. Because of the URL structure, a Facebook page shows up high in the Google rankings when people search for your organization or business name. Even if Facebook groups were available to be found by Google, their URLs aren’t optimized for search. 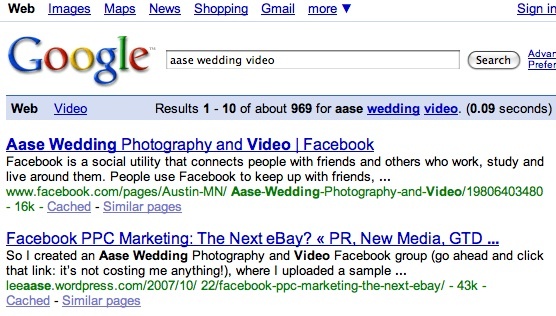 Note that my Facebook page shows up first in the Google results. It doesn’t show up high if you are searching for wedding video or wedding photography. Those categories are a lot more crowded (7.4 and 7.6 million), so it’s much harder to make the first page of Google, and I don’t have many inbound links to that page. So that’s why I say a Facebook Page can be a great online equivalent of a White Pages listing. Your business or organization’s name is in the URL, which is major cue for Google. And maybe over time a Facebook page could become an effective Yellow Pages listing, if it attracts inbound links and if its content is optimized for relevant keywords. Go to Facebook and search for Mayo Clinic. Note how many groups you find, but also that the official Mayo Clinic Page shows up at the top of the search results. Try the same Mayo Clinic search in Google. Note that the Facebook page doesn’t show up anywhere in the first several pages of results. For organizations that already have lots of web presence, a Facebook page will not immediately come up high in the Google rankings. But then again, people will be able to find contact information for those organizations through conventional Google results. Search in Facebook for your business or organization. You’ll see how many groups have been formed that mention your organization. If an official Page doesn’t come up first, you may want to consider developing a page. And if someone not affiliated with your organization has created a Page for you, you can seek to have it removed. This will be covered in more detail in Facebook 310. To enroll in Social Media University, Global (SMUG), join this group in Facebook. Read more about SMUG and our Curriculum.